The required principal stresses for element b are therefore a, = 11.22 MN/m2 (T) and <72 = 0.36 MN/m2 (C) and are illustrated in Fig. 9.49. 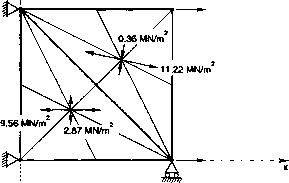 9.1 Figure 9.50 shows a support structure in the form of a pin-jointed plane frame, all three members of which are steel, of the same uniform cross-sectional area and length, such that ae/l = 200 kN/m, throughout, (a) Using the displacement based finite element method and treating each member as a rod, determine the nodal displacements with respect to global coordinates for the frame shown in Fig. 9.50.